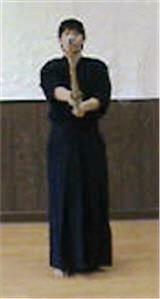 Men strike (men-uchi) is very important in kendo. 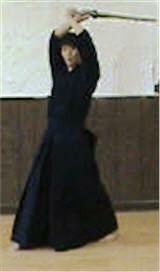 Once we know how to strike men, it is easier for us to learn kote (wrists) and do (waist). 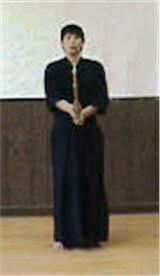 Kyodo means "movement" so sankyodo means three movements, nikyodo means two movements and ikkyodo means one movement. The reason that "sho" is in brackets is that some people say "shomen" for "men". I say this but some may not. So it is good to know both. 1. 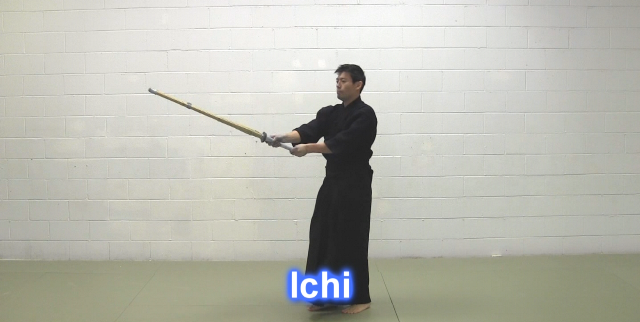 Lift up our hands above our head from chudan and take a step forwards onto the right foot on a command, "Ichi!". 2. Strike men on a command, "Ni!" 3. Take a step backwards and go back to chudan. 1. Sankyodo Shomen uchi, Hajime! The practitioners shout, "Men!" as striking a men on a command, Ni!. 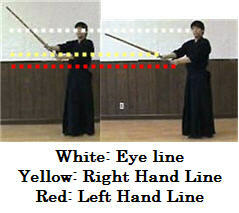 It is usually said that the right hand should be at the height of the right shoulder when striking a men. It is true when a practitioner is a kid. For kids it is important to perform everything vigorously and without thinking too much. 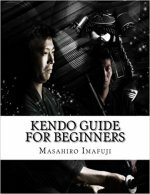 However, you will notice the tip of the sword (kensaki) is higher than your head if your right hand is as high as your right shoulder. That means you are not quite striking men. 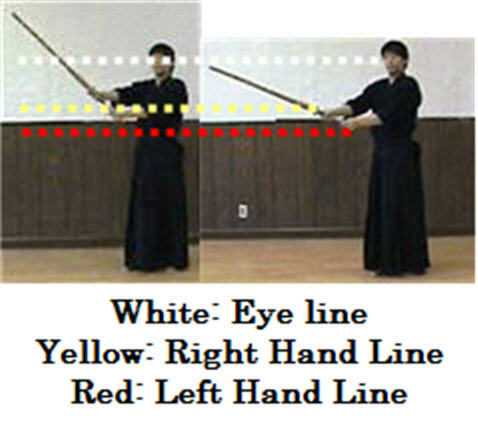 I suggest that adults should have their right hand lower than the right shoulder and keep the kensaki at your eye level when striking a men. Then, the left hand is as high as or a bit lower than the solar plexus depending on how tall we are. * You do not have to spend a lot of time on Sankyodo Shomen Uchi. If you think it is necessary to study this movement more, it is ok to spend some more time on this. 1. Lift up our hands above our head from chudan and take a step forwards onto the right foot and strike men on a command, "Ichi!". 2. Take a step backwards and go back to chudan on a command, "Ni!" 1. Nikyodo Shomen uchi, Hajime! The practitioners shout, "Men!" as striking a men on a command, Ichi! 1. Lift up our hands above our head from chudan and take a step forwards onto the right foot, strike men, take a step backwards and go back to chudan on a command, "Ichi!". 1. Ikkyodo Shomen uchi, Hajime! These are the methods of the really basic men strike training.